Cubes of challah are baked in a richly spiced pumpkin custard to make this dairy-free bread pudding. 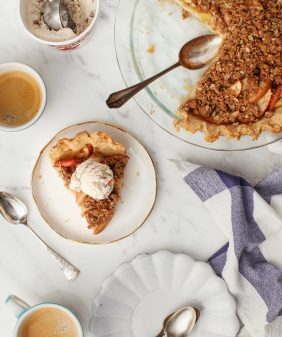 Perfect for fall gatherings on cool nights. A few days ago, my mom and I were out shopping for dinner again. As we stood in the bakery section at Whole Foods snacking on bread samples, we kept reaching for more and more pieces of this sweet potato bread. We didn’t buy any… it’s the sort of thing that’s best eaten in the store because it’s far too dangerous to have around the house. 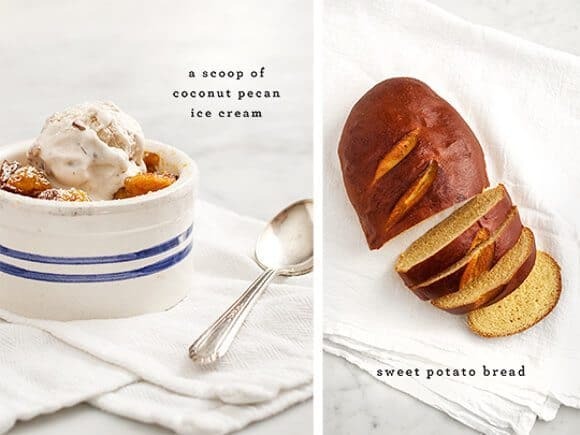 However, that night I went to bed and had a dream about making this dessert with that bread… along with pumpkin puree and coconut milk that I had leftover in my fridge. Now, I realize not everyone will have access to this specific kind of bread, but regular challah bread will work just fine too. This sweet potato bread was similar, just subtly more rich and sweet. 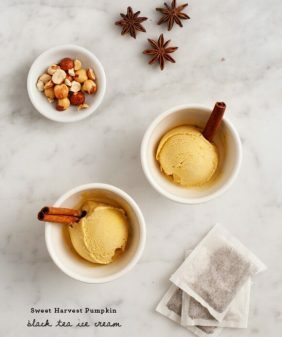 The real star here was the creamy maple-pumpkin batter. I was also going to add some pecans for crunch, but I forgot. 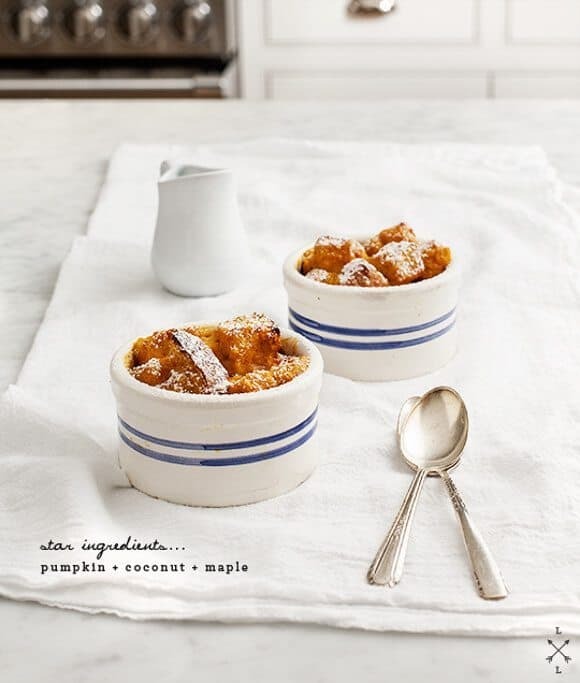 In a medium bowl, whisk together the pumpkin, coconut milk, almond milk, maple syrup, eggs, cinnamon, nutmeg, and salt. Place the cubed bread in a larger bowl and pour the mixture over the bread pieces. Stir gently, just until it all gets coated. Scoop the mix into a greased baking dish or individual ramekins. * If you are using fresh bread, you don’t need to let it sit, you can pop it right into the oven. If you’re using bread that’s a little bit stale, let it sit in the fridge for 30 minutes or a few hours. *I baked mine in a 5x7 dish as well as 3 individual ramekins. This is definitely a droll-over dish. After a long haitus, I was finally back in Austin for a week and no longer had to droll from Chicago. The food that comes out of Jeanine’s kitchen tastes even better than it looks – if that’s possible! This bread pudding was heaven on a spoon. I’m back in Chicago and putting together my grocery list so I can share this wonderful dish with family and friends. 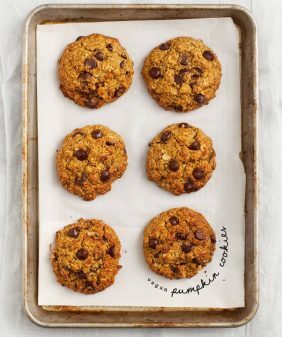 Now here is a pumpkin recipe I haven’t seen yet… yum! This sounds incredible! I love a good, warm, bread pudding! I often find that the best ideas come to me in dreams – I’m so glad you had a dream about this; it looks incredible. YUM. is this something you could prep a night ahead? 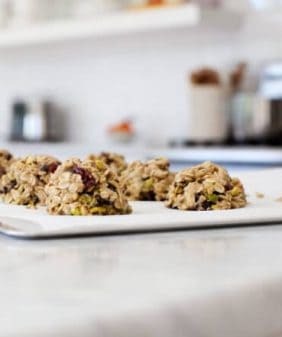 leave in the frig until you’re ready to bake the next day? or is it best to make and bake straight away? I want to say yes… but I didn’t actually try that myself so I don’t know if the bread would soak too much and dry out. But what I DID do was mix the filling, minus the eggs, and let that sit in the fridge for a few days until I was ready to use it. Then it took me only a few minutes to whisk in the eggs and then mix with the bread. I let that sit in the fridge for a few hours and popped it in the oven after dinner, when we were ready for dessert. brilliant! thank you. i AM going to try this before turkey day!! 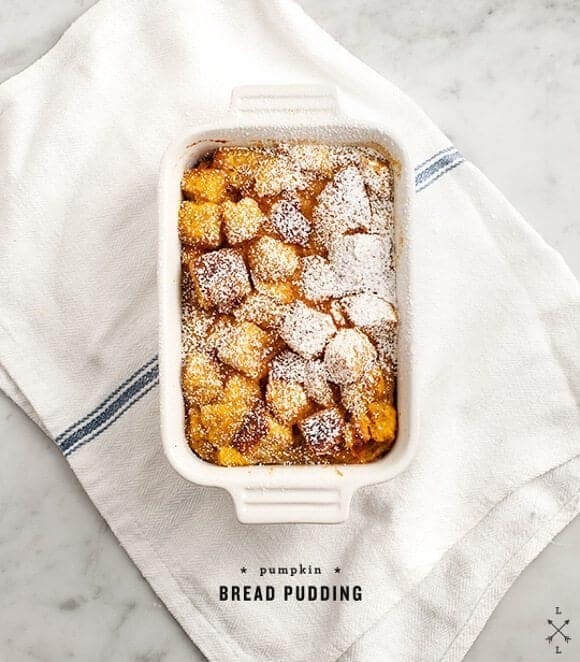 I’ve been planning to make a pumpkin pie with kabocha squash, coconut milk, and garam masala — I think I’m going to have to make this bread pudding instead. Or maybe in addition to. Love your recipes and photos! gorgeous, gorgeous. Bread pudding completes me. The pumpkin must make it so silky. Looks delicious, the batter sounds divine! Now I know what I’ll be making with my leftover challah. Saturday morning breakfast anyone? I made this for breakfast on Sunday and it was delicious! I’ve made a somewhat similar bread pudding before, so I went ahead and made it the night before and it turned out great. Hi Kara, thanks for sharing, glad to know it works to make it ahead the day before! I made this on Saturday night – such a hit. Esp when topped with vanilla bean ice cream. I used all cow’s milk (as I forgot to grab coconut milk). Does coconut milk change it much? I notice you use it often in your recipes, and am just wondering for next time… because there will be a next time. My fam thanks you!! Hi Alison, glad you liked it! I use coconut milk a lot because I”m lactose intolerant so I”m always trying to make non-dairy versions of things. But I’m glad this worked out with regular milk. I would say that the coconut milk might add more richness because it has more fat than regular milk (kind of like the difference of heavy cream vs. milk). It also has a slightly sweet coconut flavor which I know some people don’t like but I really love. This looks wonderful. I’ve never actually had a bread pudding before. I think I’ll start with this one. I love the use of coconut milk. Stunning photos! I bet the combination of maple syrup and coconut milk is just fabulous! 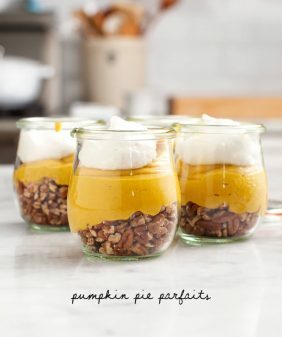 I made this as a dessert for Thanksgiving and the flavor was fantastic, I made it ahead of time and brought it over, it seemed overly soggy, what kind of texture should I look for? do you think I just didn’t bake it enough? I have enough ingredients and am going to try it again. the individual ramekins might need less baking time than a larger baking dish. Yummy foods 🙂 I like to eat it. One of the best website ever! Nice website. I really like this recipe. Hoping to continue the new ideas with healthy super food. Thanks for sharing. Aw, think that great article with really precious information. i just want to shanks for the sincerity of great information that you shared with actually i was looking for the same kind of article. Look like you are creating amazing content these Days. What a delicious item!!!! I like most these items. OWO!! I really like this recipe. Hoping to continue the new ideas with healthy super food. I am just in love with these pumpkin bread pudding. Every photo is looking excellent and delicious. You are a genius for awesome ideas. The photography is also gorgeous. 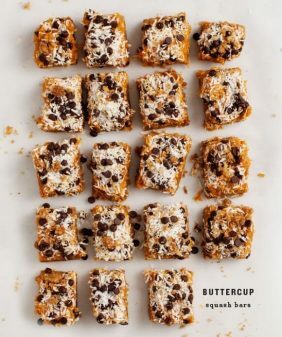 This is such a great treat to make! you could eat it for any meal and be satisfied!